This year, we were able to feed our Western Bluebirds high-quality mealworms, grown by our own Cowichan Valley Naturalists’ member: Ted Leischner. Ted is a retired agrologist, who has had a life-long career specializing in insect biology, soil science and agricultural systems. Anyone who knows Ted, knows he is a very busy guy, and is heavily involved in pollinator advocacy. Through Ted’s relationship with the Keating Heritage Farm, and their tremendous generosity, our mini ‘mealworm farm’ had a safe and spacious place to call home this summer. Through critical periods of the bluebird’s nesting cycle, we provide supplemental mealworms to encourage adult bluebirds to re-nest and pursue a second clutch in the season. Mealworms also potentially increase juvenile survival, especially in periods of prolonged inclement weather, which create challenging foraging conditions for bluebirds. While our reintroduced bluebird population is still small, we want to do everything possible to maximize bluebird productivity and survival. 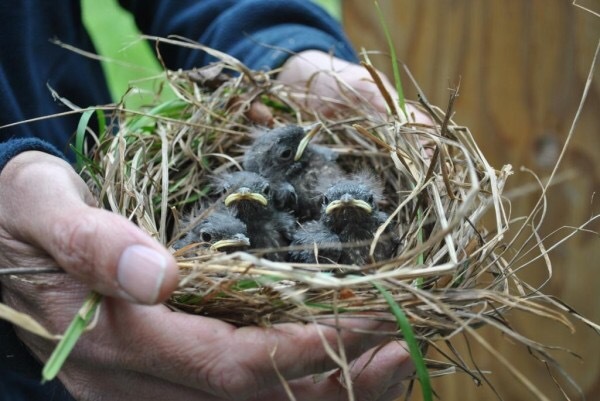 This season we’ve seen 9 successful bluebird nests produce a total of 42 fledglings. While we are fortunate to have had ideal bluebird weather throughout much of the season, we are also certainly grateful to have been providing such high quality supplemental food sources to the bluebirds. Thank you Ted for the many hours you put into mealworm maintenance and care. We know they are well looked after. Special thanks to George & Rebecca Papadopoulos of Keating Heritage Farm. And of course, thanks again to our very dedicated bluebird feeders, many of whom fed every morning for up to 2 months!! A big thank you Barb, Barry, Carol, Gail, Genevieve, Gillian, Hazel, Mari, and Willie! Next postBluebird Appreciation Event – Thanks to all for a great season!! Best Meal Worms Ever.!!!! Way to go Ted. Organic to.